Considering that this year's GI Joe Collectors' Convention is in Indiana, we're surprised the Club put this figure in the Figues Subscription Service instead of holding him back for the con. Indiana represent! Topside grew up on a small Indiana farm where he helped his father raise champion show pigs. After winning numerous county fair awards for his pets, he quickly gained the reputation as Fort Wayne's Hog Master. At the age of 20, he decided to leave the farm in search of a more exciting career with an ocean view. Topside enlisted in the navy and took to the lifestyle suprisingly well for a land lubber. He received on-the-job training in military law enforcement, eventually rating Master-at-Arms. He served as head of security on a ship that transported a GI Joe covert team to a mission site. After their deployment, he continued to monitor enemy transmissions and saved them from an impending ambush. Because of his boldness and ability to look danger in the eye, he was offered a spot on the GI Joe team. Topside knows that catching Cobra is like wrestling a greased pig in the dark. Lucky for him, that is his specialty. He's proven many times that the bigger they are, the harder they fall. However, that may not be the case when he encounters one of the Cobra organization's toughest training instructors. Ooh, foreshadowing! 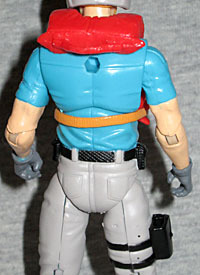 Topside was introduced in 1990, which means he was one of the last Joes to look anything like a real-world soldier. Come to think of it, most of the 1990 Joes looked pretty realistic. Sure, that was the year that brought us Sky Patrol, and Cobra got guys like the Range-Vipers, but the Joe Team were mostly wearing green and brown. Or, in Topside's case, blue and orange. Okay, it sounds garish, but it makes sense for a Navy man. Fittingly, Topside uses a mold that was originally created for Shipwreck - not this Shipwreck, the one in the '09 box set. The important thing is he looks like we imagine a sailor should look (though in the new GI Joe comic, Shipwreck complains about having to dress like Donald Duck). He has a bright blue short-sleeved shirt with a wide collar, and a pair of khaki pants that are rolled up at the cuffs. The mold used means he has normal shoes, rather than the knee-high boots the old toy had, but we're okay with that. The figure gets a new head, and it's a really nice one! He has a blonde... okay, "yellow" flattop and a full beard. It doesn't look like any detail has been lost during the molding process, and the paint is thin enough that it doesn't end up gloppy. This exact head, with brown hair instead of blonde, would make an excellent Joe Colton - get on it, someone! 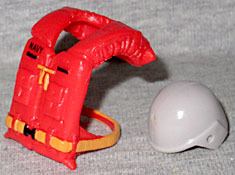 The dominant feature of Topside's design is a large life jacket, and clearly the Shipwreck mold didn't have that; so instead, he gets the same accessory that Cutter used. It doesn't have NAVY printed across the chest in giant letters - just a small tampo on the right side - but it's a nice piece and is absolutely necessary to completing his look. Well, that and the big grey helmet, but that's just the same one used for lots of Joes. 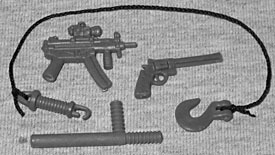 In addition to his vest and hat, Topside gets a nice assortment of weaponry. There's a hook on a string, a revolver, an MP5K and a baton. None of those are direct updates of the original gear, but the submachine gun is close, and did anybody really want that missile-launcher backpack thing? Nah. Topside wasn't one of the FSS figures I was looking forward to - I subscribed because more than half of the figures appealed to me, but Petty Officer John Blanchet fell in the bottom half. Now that he's here, though? He's surprisingly good, and I'm glad I've got him.